It is totally safe for even for the tiniest babies (see FAQ's below). The baby's foot or hand is placed in a cup of Alginate which is luke- warm and lovely and squishy so your baby should not even notice. If it is a slightly older child, they will hopefully love the process! The Alginate forms a 3D mould and after you have gone home I will take a special stone cast of the mould. The stone takes on all the details is very strong when it is set. 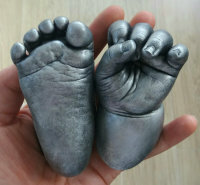 I am very careful to identify every line and fold in tiny hands and feet to create a beautiful final 3D cast which highlights all of the unique fine details. I usually allow 40 mins to 60 mins for each appointment (depending on the number of casts you require), so we then have time to relax, discuss what you'd like and to choose colours, frames, mounts and finish etc. When the stone cast is dry I will hand- finish your casting using paint, wax and polish. Finally I will frame or mount your 3D casts to your individual specification. I aim to work in a relaxed atmosphere to make the process really easy and enjoyable. Your totally unique casting will need to dry for approx 4 weeks. I will then personally paint, finish and frame you cast so it will be ready to collect in approximately 5 to 6 weeks. The Casts now need to dry before I can finish the process to your specification.